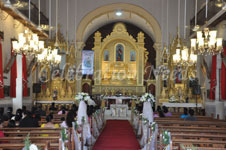 we under take church altet acquestic decoration with Audio and video system. We are contractors for Jesus calls. 1 Arch with 3 bunches of flowers and white net at entrance with net bows and flowers on pews and two bows on Bride and Groom chair. Vibe events and weeding’s elegant and exquisite Church Wedding Decoration services will let you add more beauty to your wedding ceremonies. We undertake church pew decorations, altar, pillar decorations and church entry decorations using stylish flowers and candles to add a soft romantic classy look for your wedding celebrations. 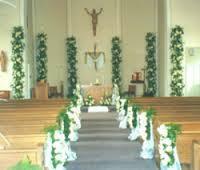 We do internal and external decoration for churches in Kottayam. Church Decorations should truly be unique. Church is a House of Worship and in any way the sanctity and purity of the atmosphere should not be marred. We take utmost care for church decoration.